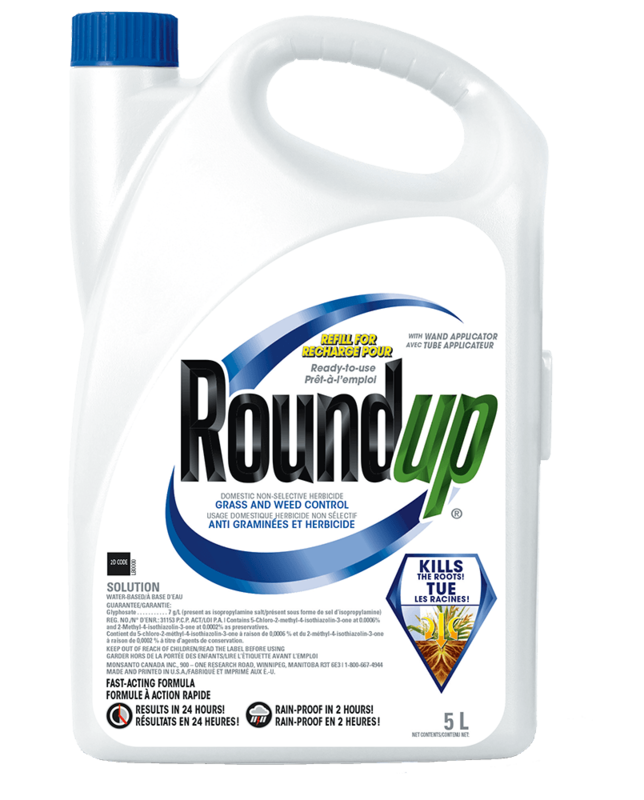 Roundup® 5L Refill, a non selective grass and weed killer, controls most annual and perennial grasses, including lawn grasses, broadleaf weeds and brush (i.e. virtually anything that is green and growing). This product is absorbed by the leaves and moves throughout stem and roots to control the entire plant. visible symptoms of control such as browning or yellowing of leaves will occur within 1-2 days. Transfer wand applicator to Refill jug. To use remove applicator from side clip, unwrap hose completely, insert plug at end of hose into spout. Twist spout to ON. Flip open applicator wand until it locks into position. Twist nozzle at end of applicator wand to desired spray pattern. Ensure trigger lock is disengaged before spraying. Hold trigger for continuous spray. Release trigger to stop spray. For best results, to ensure that Roundup® gets down to the roots, avoid tillage or disturbing the treated area for 7-10 days (or as otherwise specified on the label). This will ensure that the entire plant, including the root, is eliminated. Rain or watering two hours after application will not wash away effectiveness. NOTE: Roundup®® has no soil activity and will not leach or run off to affect nearby vegetation. Plants must be present to be controlled. Repeat applications will be required as new seedlings and vegetation emerge.